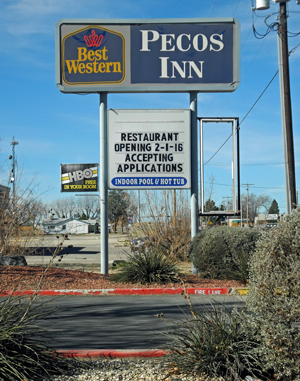 A new restaurant is slated to open Feb 1 inside the Best Western Pecos Inn at the location formerly occupied by Kwan Den. Chef Lupe’s will serve Mexican and American dishes and will be open for breakfast from 6-10 a.m., lunch from 11 a.m. – 2 p.m., and dinner from 4:30-10 p.m. The restaurant is currently accepting applications for all positions.